A Strategic Opportunity Grant from the Calgary Foundation (Grant Number 20170140) has made it possible for the TVOS to add sections on human resources to its Policy and Operating Procedures Manual. Wise Resources, Inc. was retained to prepare documents so that the TVOS can be ready to hire staff to work on special projects and deal with day-to-day administrative details when financial resources permit. At its 16 April 2019 meeting, the policies and procedures were adopted. Many thanks to Janet Mathieson of Wise Resources, Inc. and to the Calgary Foundation for making this possible. Our first edition of Then & Now newsletter!! Larry Kapustka is heading up a project through the Turner Valley Oilfield Society to create a digital story map of the area’s history. This map (33” x 50”) and was donated to the TVOS on July 26, 2018 by Fred & Maxine Davidson of Black Diamond, Alta. It is titled “The Oil Field of the British Empire” published for sale by J.W. Downes, Calgary, July 1929. Historian, David Finch, suggests that it was prepared for the purpose of stock promotion by various oil and gas exploration companies to raise money for further well drilling in the Turner Valley area. This image was sent in by a couple from Turner Valley. They found the cigarette package while tearing down their old house. If you have any images or artifacts that you think the TVOS would be interested in please contact us. Turner Valley Gas Plant now open for tours! Visit TurnerValleyGasPlant.ca for more details. Calgary artist Sandra Sawatsky guided members of the Petroleum History Society (www.petroleumhistory.ca) on a private tour of her Black Gold Tapestry, a 67 metre long, hand-embroidered artwork telling the story of oil and gas from the beginning of time. The attached link provides additional photos and stories which may encourage you to see the tapestry in person. Click on the Black Gold Tapestry logo to visit the site. Oil Fields portion of Episode 07 from Canada: The Story of Us. Courtesy CBC. Click on link and scroll down to view the video. 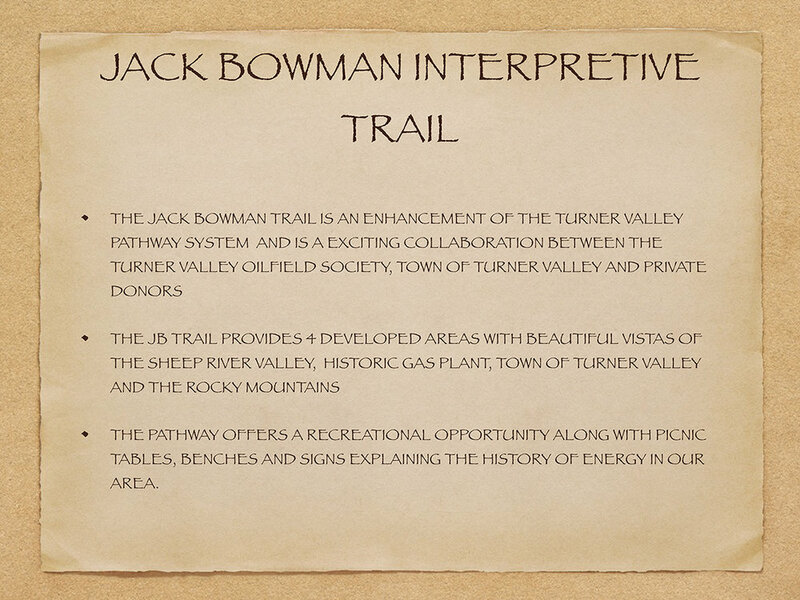 The TVOS wishes to thank the following donors for their contributions to the Jack Bowman Interpretive Trail. TURNER VALLEY GAS PLANT GUIDED SITE TOURS. Saturdays, Sundays and Statutory Holidays until Labour Day Monday. Click for more information. Join the TVOS and David Finch for the first Speaker Series talk. May 27, 2017, 2 pm at the Valley Neighbours Club. “History will be kind to me for I intend to write it,” quipped Winston Churchill. His 1929 visit to the Turner Valley Oilfield was many things; holiday, escape from failure as a politician, part of a money making tour of North America and a way to spend time with his son, brother and nephew. It was also a way for the statesman to continue to develop his capacity to understand the world he always wanted to rule. So who, exactly, was this man who visited the Turner Valley oilfield and the TVGP in August of 1929? In 1965 he died. In 1955 he retired as prime minister, two years after being awarded the Nobel Prize in Literature for overall lifetime of writing. 1953 was also the year he was knighted by the Queen. He became prime minister in 1951, a decade after his ill health became obvious to the public. When England declared war on Germany in 1939 Churchill was appointed first lord of the Admiralty, member of the war cabinet, and in 1940 he became chairman of the Military Coordinating Committee. His WWII story is well known: he was a great leader during War and encouraged the United States to join the war effort. During the 1930s he watched Hitler gain power. In 1929 his Conservative government fell, and Churchill was out of power though he did not lose his seat. As one assessment puts it: "He was perceived as a right-wing extremist, out of touch with the people...."
As a result, he spent several years in the 1930s writing “A History of English Speaking Peoples.” This period of his life is called his “wilderness years” and as part of that banishment to the wild places he visited Turner Valley. What happened to the man before 1929? Born in 1874 to an aristocratic family - mother was American, father British, he became a writer and journalist before going into politics. He was an officer and a soldier too; starting in 1895 in India and the Sudan, captured during the Boer War while as a correspondent, escaping heroically. As the first lord of the Admiralty during the Great War he commissioned oil-fired ships instead of coal. Promoted military aircraft and set up the Royal Navy Air Service. 1919 to 1922 and was minister of war. Why was Winston so interested in the oilfields at Turner Valley? It had become evident to him during WWI that the future of power lay in petroleum. He took flying lessons - and crashed a plane. And during the war the government of which he was a part seized the assets of a German company that operated in England as British Petroleum, and instantly had an oil company of its own with production and distribution. In 1923, Churchill acted as a paid consultant for Burmah Oil (now BP plc) and successfully lobbied the British government to allow Burmah to have exclusive rights to Persian (Iranian) oil resources. The Churchill tour of Canada was a month long – from Quebec City to Victoria, and part of a 3-month tour of North America. Brother Jack was with him and his son Johnny, as well as Winston’s own son Randolph. An admirer gave him a railway car for his Canadian travels. In Edmonton in late August Winston and his tour met the mayor and various provincial politicians and the lieutenant-governor of the province, Dr. William Egbert. He have a speech at the MacDonald Hotel to sold out crowd and the reception was “deafening” when he rose to talk. The next day they went to a farm where Winston cut grain with a new device – a combine. And then it was off to Calgary. Winston had repeatedly inquired about the visit to the oilfields and had learned that a forest fire near them might prevent such an excursion. Many of the details used for this presentation come from Churchill in North America, 1929 – by Bradley P. Tolppanen, a librarian in the United States who seldom travels to Calgary and gave me permission to quote from his book. I also used materials from the Churchill Archive and Alberta newspapers. The next day the entourage motored off to the oilfields, with many of Calgary’s oilmen in tow. Winston rode in an open topped car with he new friend Pat Burns, the might czar of the cattle industry and also a heavy investor in the oil industry. A who’s who of the oil patch assured the tour hit all the highlights; W. Stewart Herron of the 1914 discovery well fame and John McLeod of Imperial Oil showed Winston around the largest producing oilfield in the British Empire. They visited recently drilled successful producing wells and lunched at the Turner Valley Gas Plant in fine style. Sam Coultis, gas plant manager, toured the facility with Winston’s group, answering questions of the man who “displayed a keen interest into the intricacies of the work carried on there.” Winston also listened intently to the hardships as expressed by Herron and others as to the difficulty of securing financing from British investors and promised to help in any way he could. This included investing in the field himself. The tour went on to the EP Ranch and continued discussing the oilfield over supper. “I think I now understand how oil is produced and refined,” Winston said to his son and nephew after dinner, and promised to write about the process. The Churchill tour went for a ride on horses in the high foothills the next day at the ranch before moving on to Banff and points west. Winston’s investments in three oil companies – Baltac, Hargal and Structure – all proved fruitless as the Turner Valley companies all went bankrupts in the early 1930s. His considerable investment – tens of thousands of dollars in 2017 value – came to naught. The Churchill family motto – Fiel pero Desdichado or Faithful tho unblessed – seems to have remained true in the case of this venture. Luckily, Winston was able to make money as a writer and speaker. His insights into society were many. And so, as the petroleum industry in Canada in 2017 once again reacts to the challenges of a low world oil price and uncertainty due to the change in leadership in the United States, another of Winston’s quotes seems timely. David Finch is a historian and author of more than 20 books about the history of the Canadian West. Jackie Sills of Turner Valley took this photo of the Gas Plant April 28, 2017. The tours at the TVGP will run from May 20 to September 4, 2017. The tours will be on Saturday, Sunday and Statutory holidays. Please go to Turner Valley Gas Plant Provincial Historic Site for more information. The TVOS is embarking on an effort to establish relationships with governments, industry associations, and various associations who share an interest in advancing public understanding and knowledge of the unique history of petroleum discovery and development in southern Alberta centered on the Turner Valley oilfield, including the Turner Valley Gas Plant, and working on educational programs to enhance energy literacy. Through stronger relationships with these stakeholders, the TVOS will honour the people, their struggles, and innovations that comprise the technical and cultural history of the Turner Valley Oilfield region of southern Alberta. We invite anyone who has a story to tell about the people who shaped the area to contact us. From time to time, this blog will feature stories that spotlight the rich technical and cultural history of the region. Built by The Creative Cat Inc.